I hope that you have a had a blessed month and that – if you live in the northern hemisphere – winter hasn’t been too cold. Although in only a few months time, we will have made the transition into spring, I still have lots of sweater-weather sewing ideas that I want to realize this half-term. It seems that the first of these is the drop-waist dress. Technically speaking, a drop-waist dress is a multi-seasonal, multi-functional item for one’s wardrobe. You can layer it up with boots and jumpers, you can tone it down to just bare legs and sandals and you can dress it up for formal occasions. I love this simple, yet flattering design by Forever 21. The dress itself is slightly shaped to skim the body and give the illusion of a slimmer waist line by creating a concave bodice silhouette. The texture fabric works wonders in transitioning this dress from a fairly casual piece to a possible dinner outfit with the right jacket and accessories. 😉 You have to love it. I quite like this second dress for similar reasons to the dress above; its use of textured fabric oozes sophistication, while the structured fabric is used to give an air of flamboyancy. 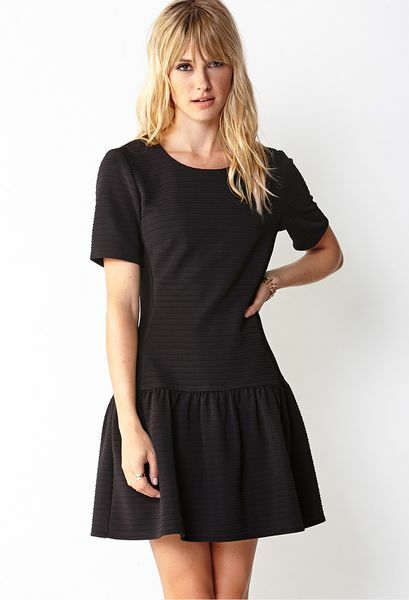 One thing to note about drop-waist dress, is that they seem to have an visual ratio. The bodice is about 2/3 of the length of the dress, while the skirt is a 1/3 of the dress length. Design wise, I feel like this give a sewer a little bit of scope for tailoring the dress to their desired length. 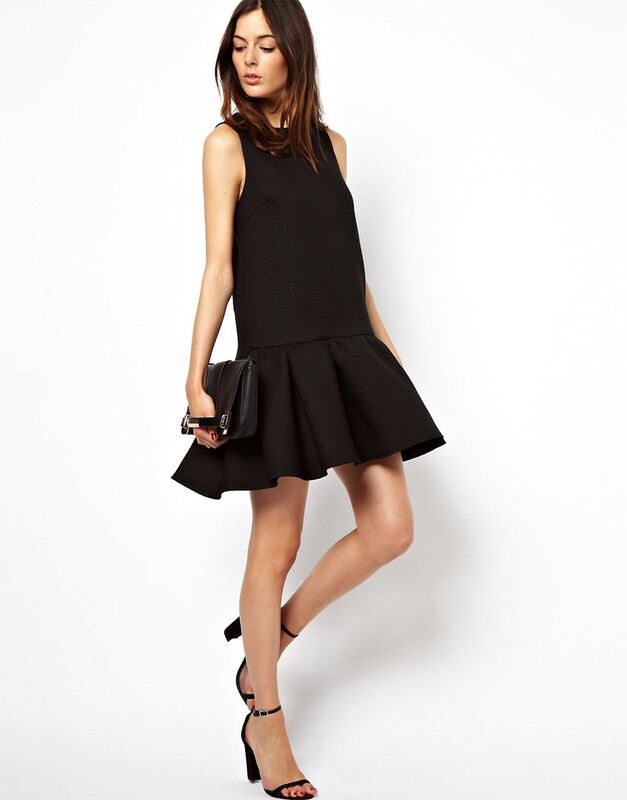 Often conventional mini-length dresses (such as skater dresses) seem to use a 1:1 ratio for top to skirt. This means that you often end up with a one size fits all design, which could be relatively modest of a shorter person, but is down-right exposing on a taller individual. Some other dresses which I liked were these two drop-waisters, featured on Wendy’s Lookbook and and CreativeGleeFashion’s “How to wear a drop-waist dress”. Colour and pattern make all the difference to how you perceive an outfit, and so I love how minimalist these two outfits are. My drop-waisted dress tutorial will be out soon. Click below to find out how to make your own drop-waisted dress.